Whether you plan to publish a comic or a manuscript, you need to manage a volume of material. Enter Celtx, which combines a database and text editor into a comprehensive tool. When you are ready to sit down and write that book you always think about, you will probably want some help getting organized. In this article, I will examine Celtx , a tool that helps you compose comics, radio dramas, movie scripts, novels, or plays. Besides Celtx, a number of other programs take a similar approach to facilitating the writer's daily grind. If you prefer a more Spartan approach, StorYBook  – a Java program – is a good choice, providing a good database that offers views and options to suit your individual requirements. Amateur writers with serious ambitions might want to check out Writer's Café . Installation is simple, and the software integrates seamlessly with the Gnome desktop. Writer's Café works with OpenOffice, is just as feature rich as Celtx, and offers many helpers and rules for users who are interested in learning the writer's trade from scratch. In contrast to its competitor, only the demo version is free; the full version of Writer's Café will set you back about US$ 65 (EUR 41, £ 33). Installing Celtx is easy, and it works right out of the box. In the download section of the Celtx project page , you will find program packages for Windows, Mac, the Eee PC, and Linux. After downloading Celtx, you can unpack the tarball in the shell by typing tar xvzf Celtx.tar.gz, then type cd celtx to change to the newly create directory. When you get there, type ./celtx to launch the writing tool. Figure 1: If you need help, check out the wiki on the Celtx website. On launch, Celtx comes up with a clear-cut splash screen (Figure 2) that gives you a couple of options. 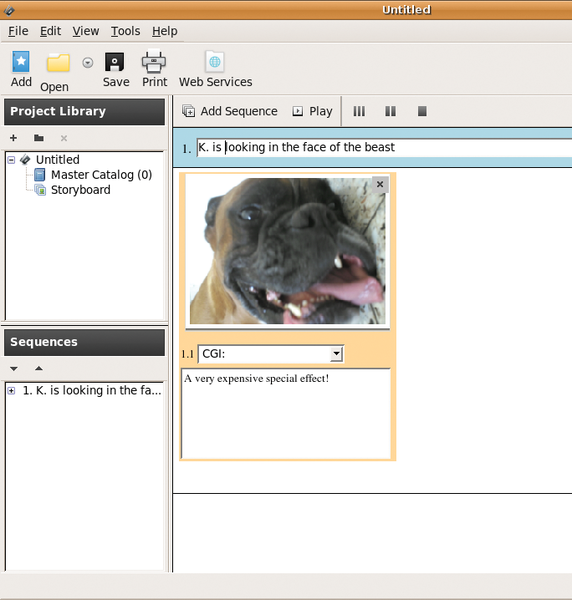 On the left side of the window, Celtx offers a selection of project templates that cover topics such as text, movie, theater, comic, and radio play. The right side of the splash screen offers a selection of classical works prepared as examples – such as the H. G. Wells' radio play War of the Worlds or Oscar Wilde's The Importance of Being Earnest – that will give you an excellent overview of what Celtx offers. Figure 2: Celtx displays a splash screen that offers a selection of project templates and examples. After selecting Wilde's play, you will see a number of tabs in the left-hand sidebar. The tabs give you a clear overview of the wide range of fields involved in producing a play. For example, the Stageplay tab contains the literary work with acts, setting descriptions, and dialogs in a text editor. The editor might seem spartan, but it works in an intelligent way with the use of conventions and indenting that distinguish a play or other literary scripts in printed format. This feature distinguishes Celtx from Emacs or other word processing software. For example, the software attempts to identify the format of any text you type as a Dialog, Heading, or Figure. If the editor fails to identify the format, you can choose the correct format from a pulldown menu on the left-hand side. Also, the editor has a function for converting the complete script, including the cover, to PDF format (see Figure 3). Figure 3: The program's text editor offers a number of extras, such as automatic format identification and a PDF converter. At first, the Tea Images tab, with its pictures of teacups and sandwiches, might seem slightly strange. In fact, this is a suggestion for the set in scene 1 (Figure 4). With this option, you can add sketches or photos to a project, scene by scene, and access this data whenever needed. The Production Schedule tab takes you to a calendar that lets you plan the production down to the minute. Finally, the Master Catalog gives you a database with resources such as photos and addresses of actors involved, locations, and set designs – all of which are organized in a clear-cut way, scene by scene. The next section tells you how to work with these resources. 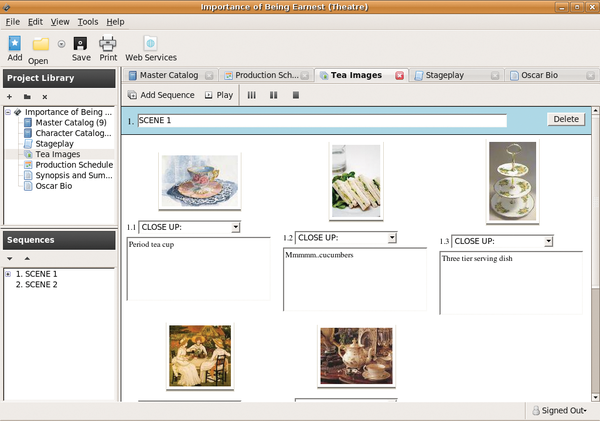 Figure 4: If you are planning a play, you can collect the set design elements in the Tea Images folder. The sidebar on the left of the window offers a further option for breaking down your material. In the case of Wilde's play, you will see the Project Library in the top half. This contains a filesystem tree with the root of the project named Importance of Being Earnest containing various entries. 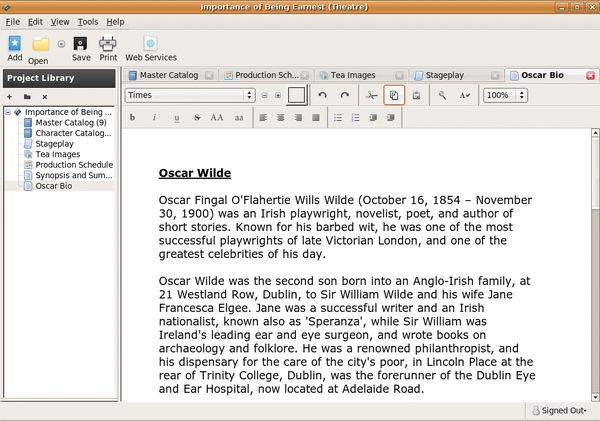 The entries include tabs such as Master Catalog, Stageplay, Character Catalog, Synopsis and Summary, and Oscar Bio, a short biography of Oscar Wilde (Figure 5). Figure 5: The sample Oscar Wilde play in Celtx includes a biography of the Irish author. The second part of the sidebar changes its appearance or is hidden – depending on the context of the project element you are accessing. For example, if you click the production equipment in Tea Images, you will see the play's Sequences in the lower half of the sidebar. The Stageplay view breaks the play down into acts and scenes. The lower part of the sidebar helps you navigate quickly through the acts and scenes via the view shown in the right pane. Of course, you do not need to keep the tab names and descriptions – you can name the project library, the files, and the tabs to suit your own needs. Not every piece of work will be as large as this sample. Although Celtx is used mainly for drafting theater plays; scripts for radio, movies, and TV; and comics, the program can also help you to structure a longer piece of prose, such as a novella or novel. As a simple example, imagine you are planning a novel titled "The Magic Mountain" . First you would choose the Text template on the Celtx welcome window. Celtx would then come up with the Text and Main catalog tabs, which you would see in the sidebar below Project Library. The next step would be to assign a name to your project. To do so, just right-click the root directory of the project tree in the side bar, which is originally titled Unnamed. In the context menu, select Rename and enter "The Magic Mountain" in the dialog that then appears. Clicking the Main Catalog tab opens a list with the headings Name, Category, Description, Tags, and Media. The + Add button lets you add elements to the empty list, such as Characters, Scene Details, or Location. The element list contains all kinds of entries, but you might be able to do without fields like Costumes or Stunts for a novel. Because a good story depends greatly on powerful characters, you will want to select Characters and think of a name, which you then type into the text box in the element window – say Hans Castorp. The right window now tiles horizontally with the tab Character: Hans Castorp. In the fields, you can enter this character's characteristics. The field labels are self-explanatory. Here you can add an image to the Media field – a portrait of the character perhaps. The Detailed description of body, Motivation, and Background to character fields round off the image of your novel character. To complete the Characteristics, you also need to consider the character's main role in your story: this could be the Protagonist, Antagonist, Best Friend, or something completely different. At this point, you can add one character after another to your narrative, as well as multiple Locations; however, if you click Map of scene in the Address section, the program will launch your web browser and take you to Google Maps. Adding a Scene details element lets you define precisely what happens in which scene, who the protagonists and antagonists are, what their motivations are, and whether they reach these objectives in the scene. This element is important to a story, in that good material always has scope for conflict. To create a storyboard, including a short description of all its sequences, click the plus sign (+) in the sidebar or click the Add button in the menu. Again, you can choose from a list of elements – in this case, you need the Storyboard – which you might recognize from your first steps with the Oscar Wilde example. Press the Sequence button to add one sequence after another (Figure 6). For example, 1. Hans Castorp takes the train from Hamburg to Davos, 2. Hans Castorp arrives in the sanatorium in Davos, and so on, until your story unfolds in front of your eyes – all you need to do now is write it. Figure 6: Compiling the story scene by scene. If you’re looking for a way to organize your next novel, try StoryLines and the Writer’s Cafe suite.